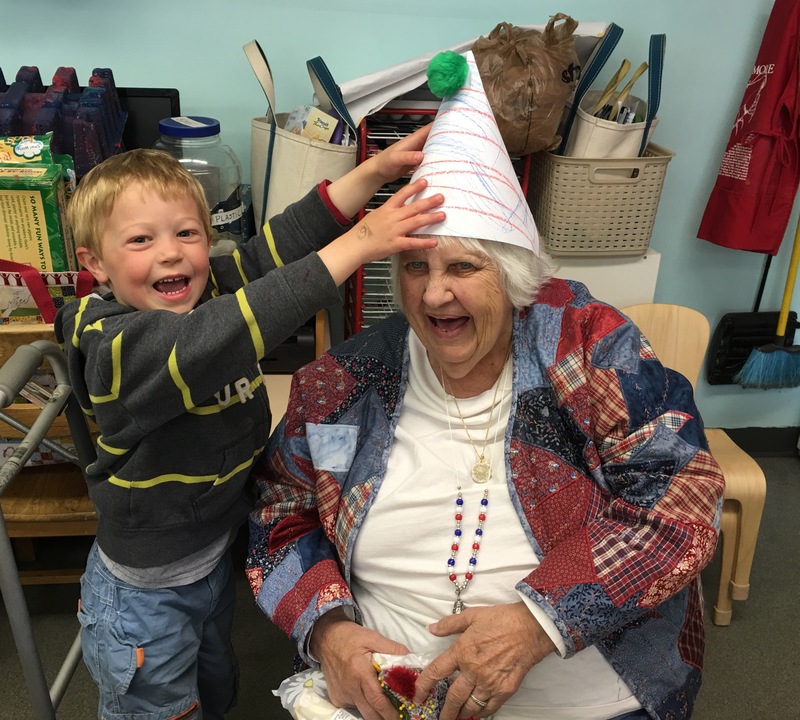 We wished Milly a Happy Birthday this week, as she turns 87-years-young. 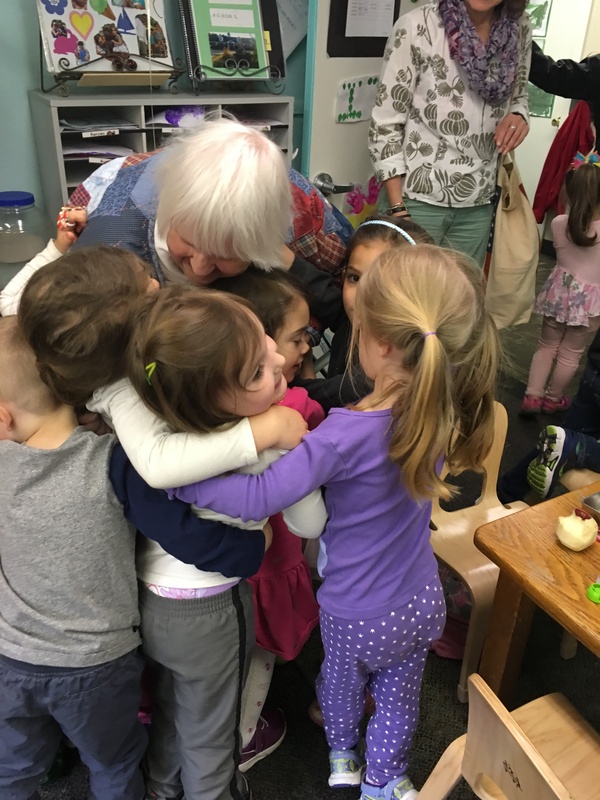 Since 2009, Milly has been connecting generations with my preschoolers. I get to stand back and watch love and happiness ignite into hugs and smiles, from both the children and Milly. She plays Bingo and Go Fish, sings and reads stories. Children like her walker and like to watch her sew. A needle and thread weaving in and out of fabric is fascinating. It’s quite remarkable and very genuine. When Milly began her visits to my classroom, I had looked far and wide for a master quilter. Children were bursting with ideas about peace- not the typical ideas, their ideas. Why not turn those into a quilt? We did! It is even my blog photo. Since then, Milly has made other quilts with the children, and is finishing one that has been two years in the making. 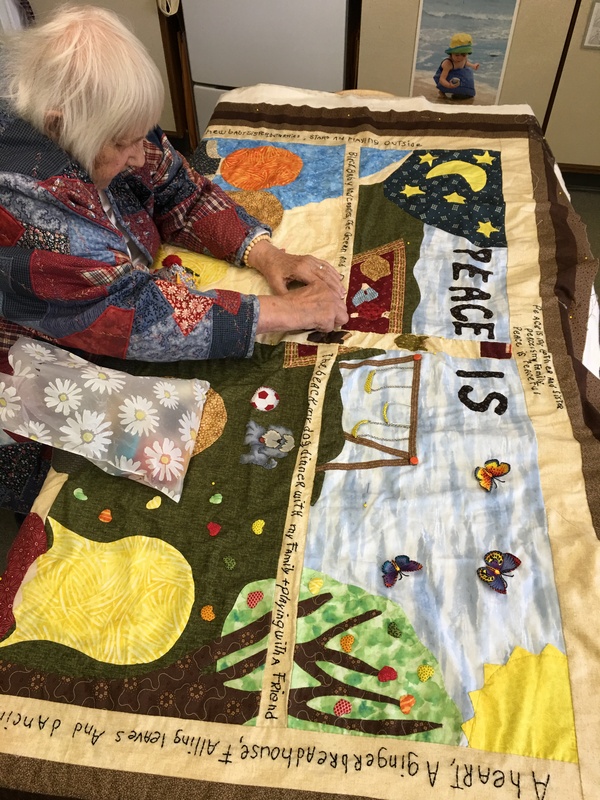 The incredible journey of her quilts began with Gloria, who has a Peace Quilt of her own. Gloria is Milly’s best friend, and does more for teaching children about kindness and peace than any other person. After all, even though she may not look pretty, and likes to wear black all the time, it’s what’s on the inside that counts. The children know that and befriend Gloria (who goes home most every weekend with a child). Thank you, Gloria, for being you, and for sharing your Peace Quilt. Thank you, Milly, for being you, and for sharing your amazing quilting and your big heart with the children. Happy Birthday! 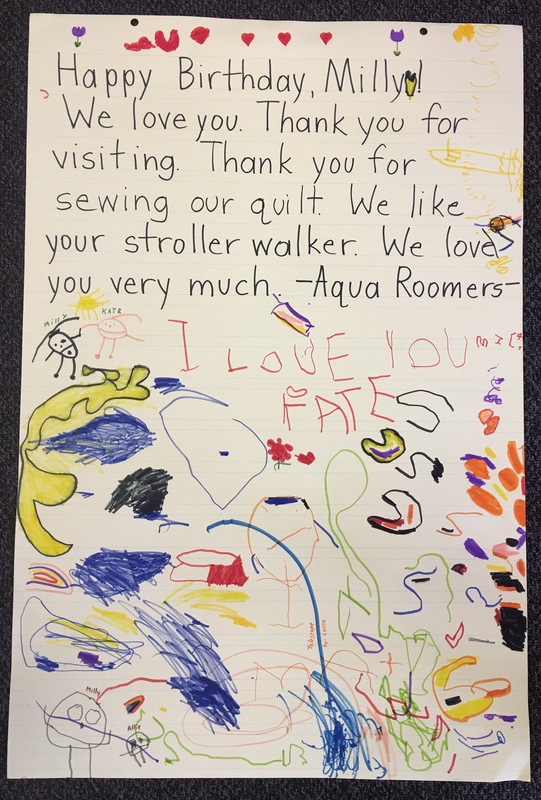 This entry was posted in Diversity, Early Education, Kindness, Peace, quilting and tagged connecting generations, Early Education, Peace, Peace Quilt, quilting, quilting with children. Bookmark the permalink. Still hand quilting at 87!!!!! Wow. And she still loves being around children too! I’m all for celebrating that. Pass on the hugs and good wishes. I will do that, Marlene. It really is amazing that she is doing all of this by hand. At 87. This quilt is going to hang at the Massachusetts State House. Big presentation in late June. The Governor will be in attendance. I’m so happy for Milly! I’ll write a blog post after the event, of course! Looking forward to reading about it. Wow! Yay, Milly! Keep on going! Makes me want to cuddle up with Gloria, Milly & that Peace Quilt…Happy Birthday to Milly! What a grand old lady. Wonderful to see her sharing her skills and experiences with those tiny children. Great to see them appreciating old age, and Gloria’s diversity too. She is, indeed. The children adore her. Win-win all the way around. Gloria is such a staple in the classroom. She’s the most natural way to bring diversity, everyday. Uplifting for sure! Best to you, Pete! Happy birthday, Milly! What a wonderful achievement, bringing hugs, love, and peace into children’s lives and hearts. I remember reading about Milly and her (and your) quilts, and your friend Gloria, before. It’s lovely to be reminded. Happy Birthday, Millie. Thank you for sharing your time and kindness with the children. Thank you, Robin. She is wonderful! Thank you, Robin. You would adore Milly. She has made the biggest difference in the lives of children. How precious! Happy Birthday Milly. Your blog photo is the quilt? You mean, your header image? That is a quilt? WOW! Fantastic! Yes it is, Ren. Pretty cool, huh? Thank you so much! Happy Birthday to Milly, she sounds amazing!